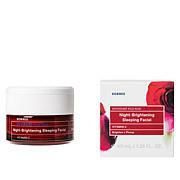 After nighttime cleansing routine, apply to the face and neck, avoiding the eye area. 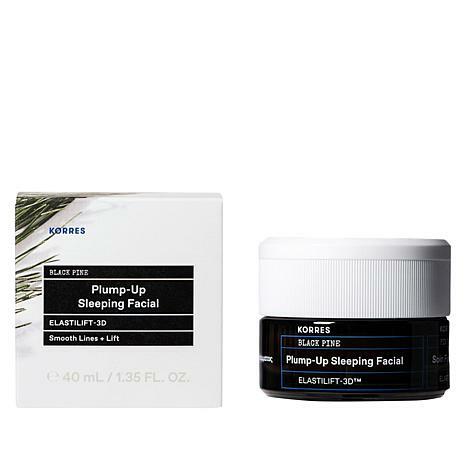 Use alone or over Black Pine 3D Firming, Face Serum (sold separately). 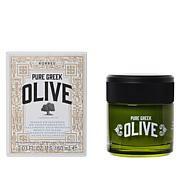 Ingredients: Aqua/Water/Eau, Caprylic/Capric/Myristic/Stearic Triglyceride, Propanediol, Caprylic/Capric Triglyceride, Glycerin, Cetearyl Alcohol, Glyceryl Stearate Citrate, Isoamyl Laurate, Cetyl Palmitate, Crambe Abyssinica Seed Oil, Olus Oil/Vegetable Oil/Huile Vegetale, Passiflora Incarnata Seed Oil, Squalane, Sinorhizobium Meliloti Ferment Filtrate, Ethyl Linoleate, Behenyl Alcohol, Alpha-Isomethyl Ionone, Ascorbyl Palmitate, Avena Strigosa Seed Extract, Benzyl Alcohol, Benzyl Salicylate, Butylene Glycol, Cetyl Hydroxyethylcellulose, Citric Acid, Citronellol, Coumarin, Dimethyl Isosorbide, Epigallocatechin Gallate, Epigallocatechin Gallatyl Glucoside, Ethyl Linolenate, Ethyl Oleate, Ethyl Palmitate, Ethyl Stearate, Glyceryl Caprylate, Helianthus Annuus (Sunflower) Seed Oil, Hexapeptide-11, Hexyl Cinnamal, Lactic Acid, Lecithin, Linalool, Lonicera Caprifolium (Honeysuckle) Flower Extract, Lonicera Japonica (Honeysuckle) Flower Extract, Parfum/Fragrance, Pentylene Glycol, Peucedanum Graveolens (Dill) Extract, Phenoxyethanol, Pinus Nigra Bud/Needle Extract, Potassium Sorbate, Salicylic Acid, Sesamum Indicum (Sesame) Seed Extract, Sodium Benzoate, Sodium Carboxymethyl Beta-Glucan, Sodium Citrate, Sorbic Acid, Spilanthes Acmella Flower Extract, Tetrasodium Glutamate Diacetate, Tocopherol, Tocopheryl Acetate, Xanthan Gum. The moment I put this cream on, my completion is more youthful, glowing and healthy looking. It's like liquid sunshine in a jar. When I wakeup and look in the mirror, my completion don't look don't look dull any more. I wish I had taken before and after pics because the firming and lifting results even after one use were significant. My nasal labial folds were really decreased. After two weeks the results keep getting better! I am really impressed with this. I even use it on my hooded eyelids even though it says avoid the eye area, (I assume because exfoliant in your eye would hurt - a lot) with amazing firming results. My eyes look so much more open. Oh, and...the best part, the results Don't go away when you wash it off. They just keep getting better Loooove it!! It's got some fragrance that isn't my cup a tea but the results are well worth it. I actually look forward to using this every other night. My skin looks great too. Healthy and gently exfoliated. Again, A+. 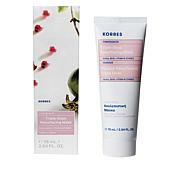 Thank you Korres!! 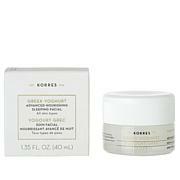 Normally I love Korres products but this one destroyed my skin after only three applications. Perhaps I'm allergic to one of the ingredients... But I'm terrified my skin will be permanently affected. Scary... Clearly, I'm returning this. Be wary if you have delicate skin.